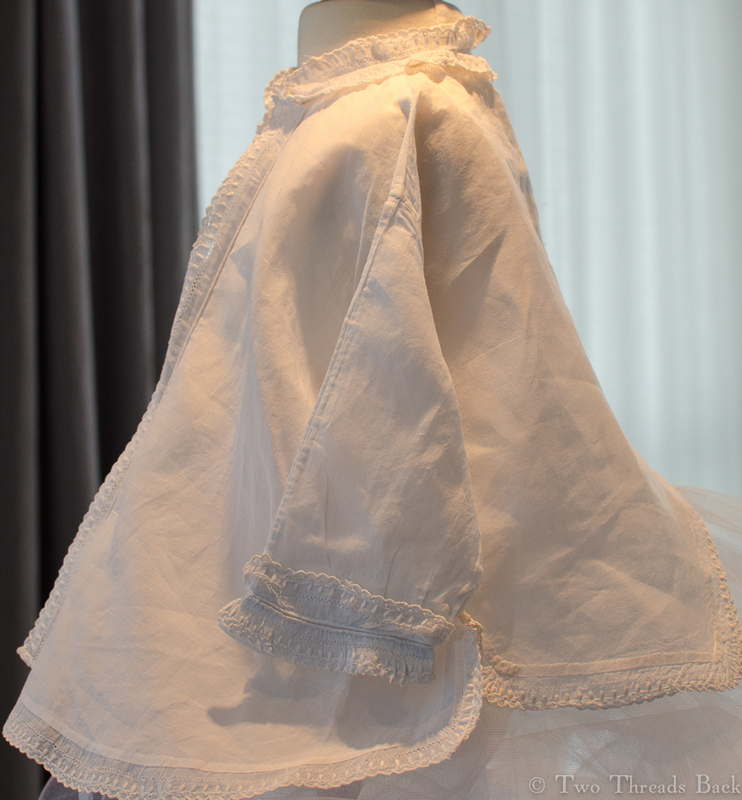 An infant’s sacque: a miniature version of Mother’s. If I kept my attention only on plain work, I suppose I would be very limited indeed. And truly, the impulse to add ornamentation seems timeless and universal. Often the pretty pieces I study reveal high standards in the basic plain stitches, but also have considerable fancywork on them. The profile reflects women’s styles of the same era. Here is one example which just seems to shout Baby Version of Mommy’s 1870 Upholstered Look! Notice the dropped shoulders, two-piece sleeves and sort of tabbed lower edge, with its allowance for a wee bustle? 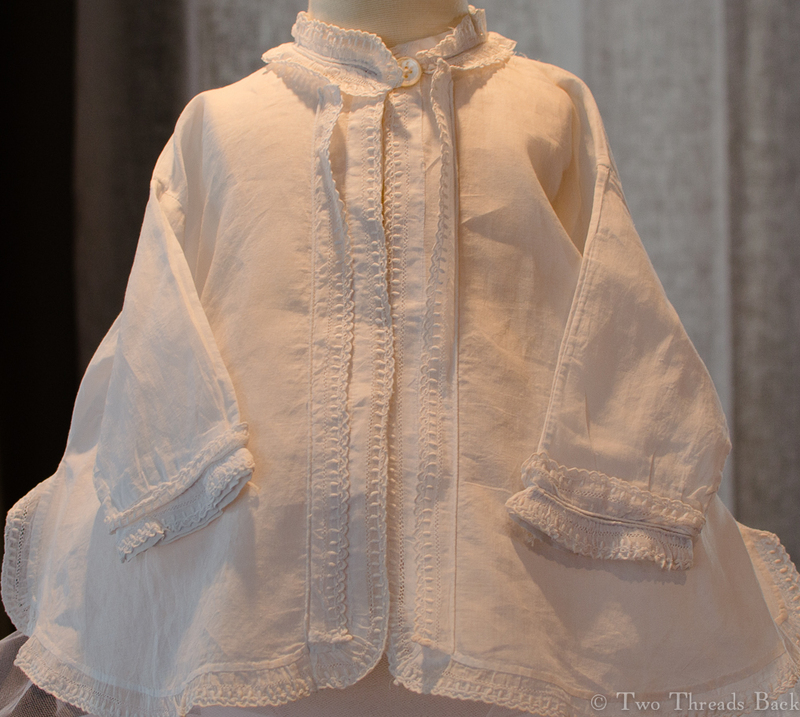 I doubt baby wore one, but the cut of the sacque would have suited it! The pattern is a match for women’s garments of the late 1860s and early 1870s. Pretty fussy back! But I love it. 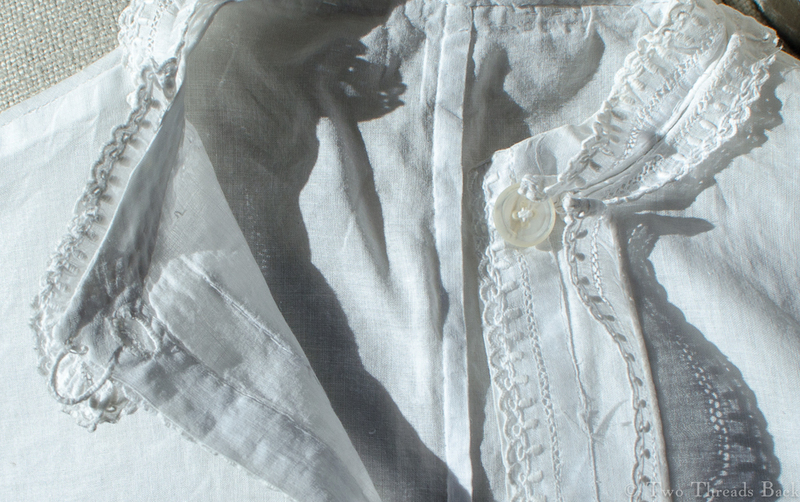 It’s made of a very fine muslin – a previous owner must have bleached it white again – and uses basic hemming, running, and stitching (called backstitching today). 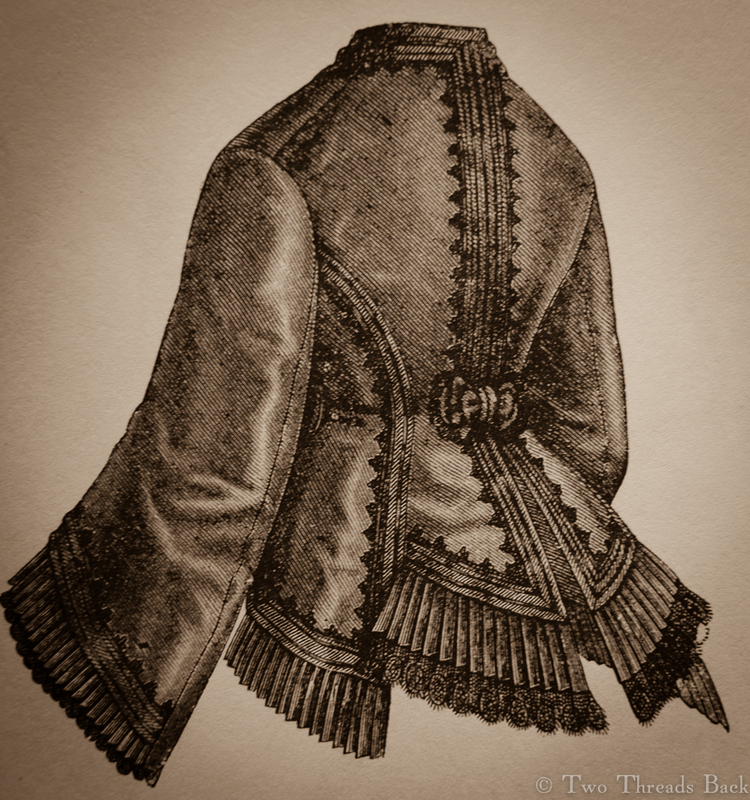 It shows some of the earliest use of (what we call today) a french seam on the sides and shoulders. The sleeve seams are overcast. I’d love to see this with a poofy baby bustle! Not likely, sigh. 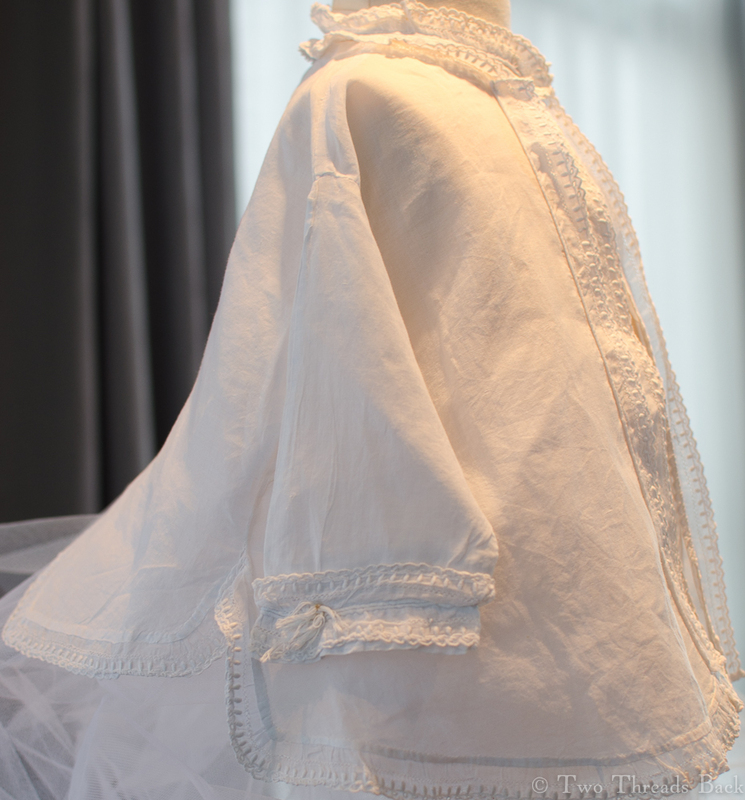 The sacque has a high collar with hand-embroidered trim and fastens with a single mother of pearl button and thread loop. There’s a buttonhole hiding under the trim on the collar, but Mother must have decided it was too tight or difficult to fasten. The same trim edges the front, hem, and cuffs. There’s even a bit of piping. Close up of the collar & fastening. 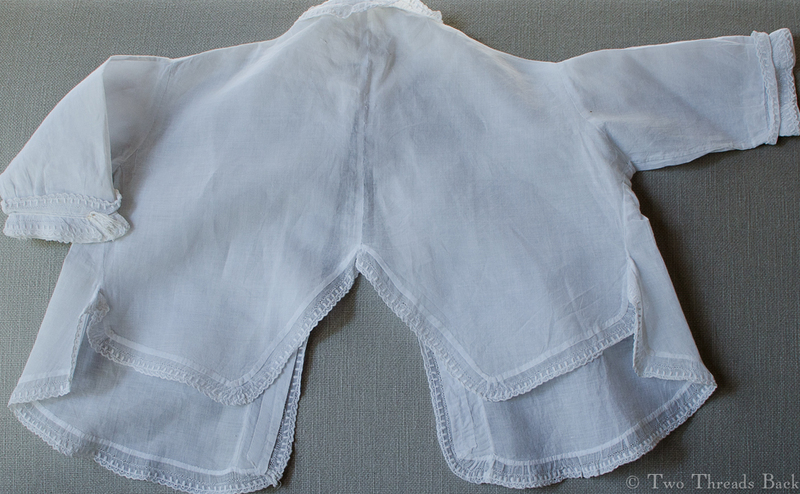 The cuffs were taken up with a hidden tuck to fit shorter arms, and they also have tiny thread tassels. I thought at first the threads were drawstrings for the cuffs, but closer examination shows them to be attached separately and knotted around… a bit of wool? …held with glue? I can’t see it well enough to tell, but it has yellowed over time. 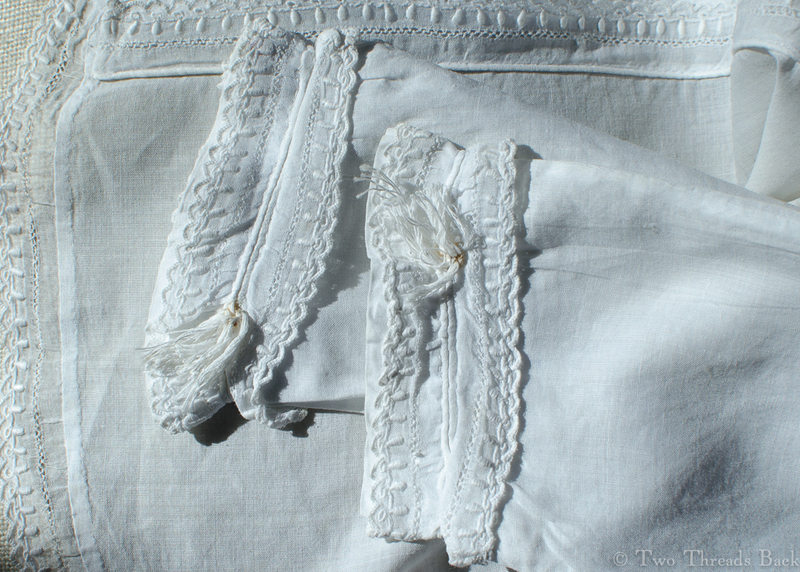 Close-up of the little cuffs – you can just see the tassels. A view of the back, showing the pattern. The trim down the front is turned toward the center, the opening. 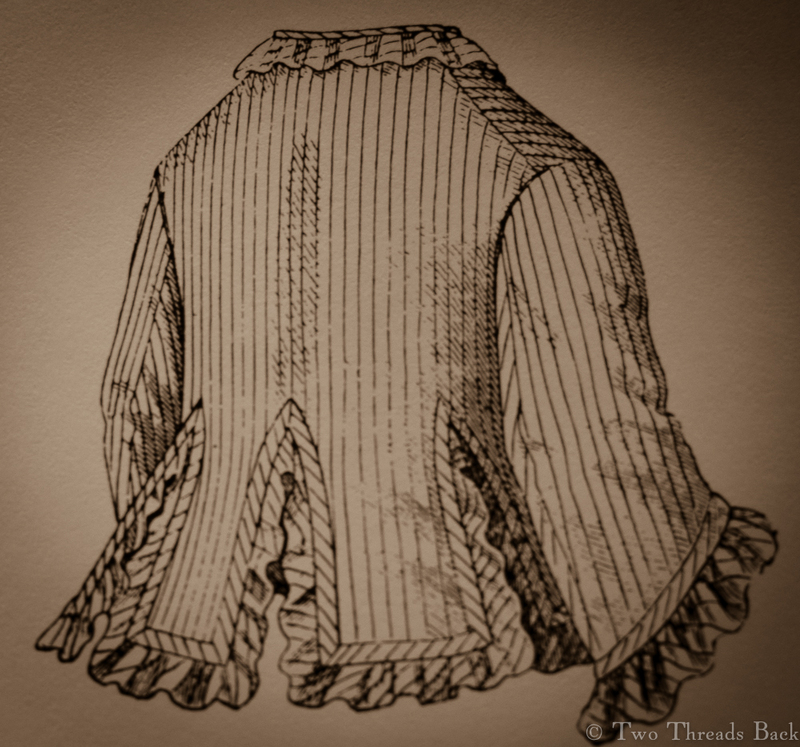 This is typical of 19th century clothing, although my modern expectation is to see tucks or trims folded or facing outward (toward the arms). In all, it’s plain made fancy. And enough to make me swoon over the tiny confection! This entry was posted in Antique Clothing, Children's Clothing, Fancywork, Hand Sewing and tagged Antique Clothing, Fancywork, Hand Sewing. Bookmark the permalink.